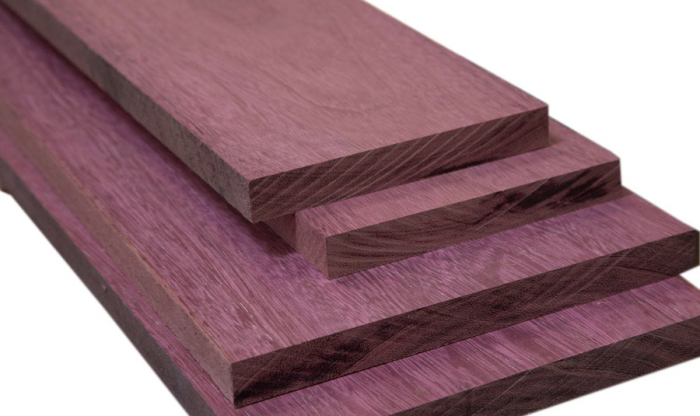 Purple Heart is not only a noted medal for bravery awarded by the US Military, but it is also a beautiful exotic hardwood varietal! We recently worked on a project that called for the use of this unique vibrant species of wood, and I was so lucky to be able to watch this wood come to life in a project! Purple Heart grows mainly in Central and South America in tropical rainforests. It is a flowering plant that grows into trees that can be as tall as 160 feet. 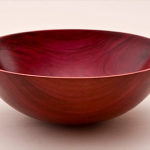 From the outside you wouldn’t have any idea about the wood’s hidden secret—but when you cut into the heart of the tree, the dark brown interior turns to a rich purple color! The exposure to UV light is what causes the magical color transformation. 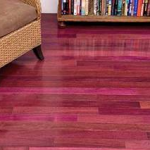 The natural shade of the wood is absolutely gorgeous, and it is hard to believe that this bright shade of purple develops on its own in the wild! 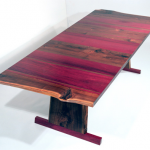 When looking at it, one would think it was simply wood stained purple—but it is NOT! Instead, it is one of nature’s colorful little gifts to humanity! This particular hardwood is very dense and requires a sharp carbide blade to cut it. When building with it, one runs the risk of it tearing or splitting it if it isn’t approached properly. But, as with anything, a little tender loving care allows the craftsman to utilize the beautiful wood in an effective and purposeful way. 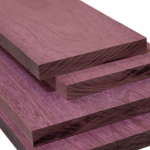 Besides the beautiful eggplant purple color, Purple Heart is very durable, ranking among the very stiffest and strongest woods in the world. 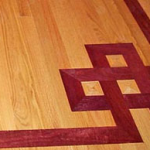 Accordingly, this hardwood is sought after for many projects that call for rigidity and durability such as: ship building, flooring, furniture, and heavy construction. Purple Heart is also strangely resistant to insects and the resistance it has to dry-wood termites is notable as impressive. 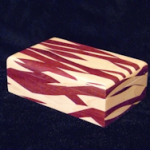 Purple Heart is very popular among turners and carvers who use the exotic wood for sculptures, carvings, billiard accessories, trim, inlays and accent. Think you might like to have your own Purple Heart accessory? Give us a call! We would love to design and build it for you! This entry was written by brian, posted on November 15, 2011 at 8:11 am, filed under News. Bookmark the permalink. Follow any comments here with the RSS feed for this post.